I had a rare insight into my son’s artistic abilities yesterday when I found him in the bathroom (after a long and suspicious silence) with a face like he’d been snogging a punnet of raspberries. 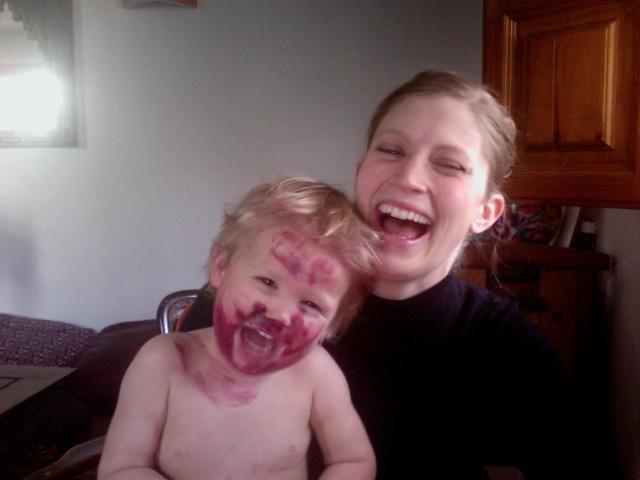 My favourite lipstick was all but gone – from the barrel, that is. It was pretty much everywhere else: inside his nostrils, rubbed attractively across his neck and top lip, on one eyelid, smeared across the sink and counter, all over his freshly washed clothes and, most likely, already running the gauntlet of his digestive system. God only knows what a teaspoonful of carnauba wax will do to his (very) small intestine. I fear the end products will be Vrai Bordeaux for a month. But it gets better. When I attempted to take off his clothes to plop him into the bath, fighting back hysteria as I did so, the thick layer of warpaint around his mouth smudged in a Rorschacht-like fan across his forehead and gave him a pink quiff like some sort of terrible 90s trance party throwback. Sadly, scrubbing it off wasn’t quite so hilarious. But we managed to get some photos (with me holding him suitable far away from all soft furnishings) in the process. Cavechild has truly lived up to his name. This had me in stitches! I can just see it!